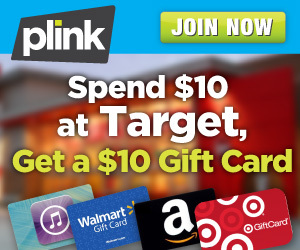 Get a FREE $10 Gift Card when you Sign up for Plink and then spend $10 at Target! Kind of like getting your $10 shopping trip for FREE! 2) Register your credit or debit card. 3) Shop at Target using the same card and spend at least $10 by 4/28! 4) Plink will add $10 to your account which you can redeem for a $10 gift card to many different places. Then continue to use Plink and redeem other offers for points and gift cards. It’s pretty easy and a great way to earn a little extra for doing the things you do already.So get signed up for Plink today! FREE Crock Pot Cake Mix Recipes to Download!